Naturally Delicious, Inc, sells premium natural homemade ice cream in 8 flavors. We also use as display an antique Hit N Miss engine ice cream maker. 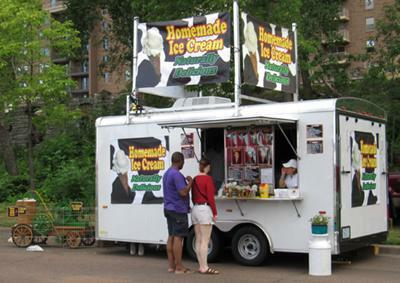 We have a concession stand and tent stand and do shows in Wright, Ramsey and Hennepin Counties. For booking information contact: Jim and Robyn Seitzer - #763-441-5014. Join in and write your own page! It's easy to do. How? Simply click here to return to Minnesota Vendors.